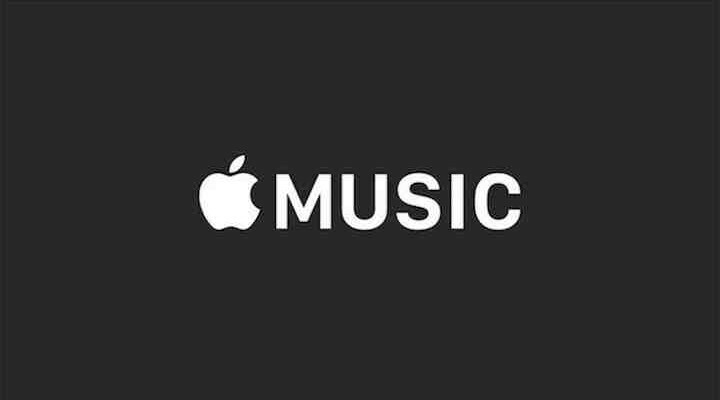 It is hard to believe, but Apple Music has been streaming songs for a month already. During that time, the service has been much maligned, with critics, many of whom say that it has a long way to go before it catches up with competitors like Spotify. Still, in just four short weeks Apple has managed to already garner more than 10 million subscribers, many of whom are no doubt taking advantage of the generous three-month free trial period. If you’re one of the early adopters who singed up to see what Apple Music is all about, you’ve probably already made up your mind as to whether or not it is something you’ll be willing to pay for when your free trial ends. Here’s how to avoid continuing to pay for the service by disabling its automatic renewal feature. As with most subscription services, Apple’s hope with the free trial period is to get users so invested in their product that they’ll actually want to start paying for it when their test run has finished up. 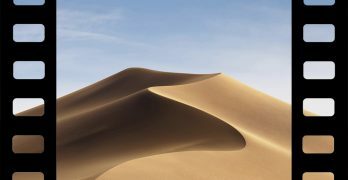 For many, that won’t happen until after September 30, which is also plenty of time to forget that you entered your personal information and credit card number when initially joining Apple Music. 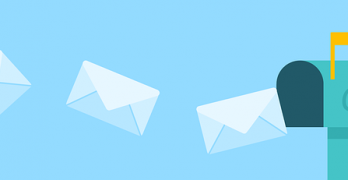 Fortunately, it is actually surprisingly easy to turn off automatic renewals, which is not something that can be said for all services of this type. 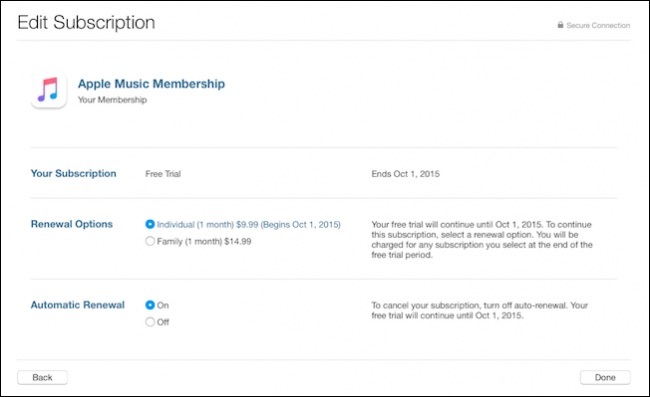 If you’ve already decided that you won’t be paying for Apple Music once your free trial period has ended you can go ahead and turn off the auto-renewal option now. To do so, simply launch the Music app on your iOS device and tap on the red account button – which looks like the silhouette of a person – in the upper left corner of the screen. After entering your Apple ID password, click on the option that reads “View Apple ID” and then select “Manage” under the “Subscriptions” heading. On the next screen you’ll see a toggle switch for automatic renewals in Apple Music. When turned off, your service will end at the completion of the free trial period or the next billing cycle. Enter your password for your Apple ID when prompted and select the option to “Manage” your subscriptions under the heading marked “Settings.” From there, you’ll see the subscription for Apple Music, and an option to turn off automatic renewal as well. That’s it! 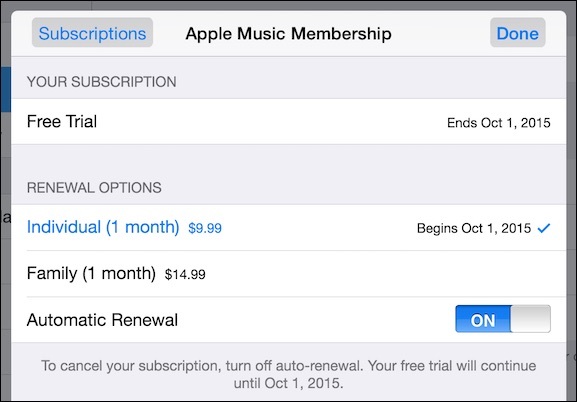 That’s all you need to do to disable automatic renewal in Apple Music. Quite frankly, Apple couldn’t have made it much easier for us to opt out of their streaming service, even if the settings are a bit buried inside iTunes and the iOS Music app. If you’re already sure you don’t want to renew, go ahead and disable payments now. That way you won’t get any surprises at the end of the free trial period in a couple of months time.